2014 is upon us, and it’s time to gear up for the many possibilities the new year brings for your career, especially if you’re job searching. Here are five New Year’s resolutions to help job seekers land the career of their dreams and make 2014 their best year yet. Remember the world was supposed to end with Y2K, and it didn’t? Then, 12 years later the Mayan calendar predicted the world was going to end on December 21, 2012, and it absolutely didn’t happen (again). The world may not actually be ending anytime soon, but, if it was, what career dreams would you like to live out in 2014? If you’re a job seeker, then now’s the time to reflect on what you have learned thus far in your career and use the lessons learned to catapult yourself into the career of your dreams next year. 1. Shape up or ship out. We’re not talking about shaping up physically (exercising and dieting), we’re talking about cleaning up your act and getting serious about what it is that you want out of your career. If you’ve been struggling with landing a job this year, then it’s time to take a step back and consider how you’re portraying yourself online and on your social networks. If you don’t think that employers are scouring your social media profiles, then you’re probably not aware that what you’re posting and sharing is affecting your candidacy – and it’s, most likely, not in a good way. Despite your profiles being private, there are always those unexpected things that slip through the cracks, like a careless tweet or a drunken picture that your friend tagged you in. It doesn’t take much, nowadays, for a hiring manager to pass a candidate up because of something questionable or inappropriate discovered on social media – even a simple Google search on a candidate can be a deal breaker. To clean up your online profiles, take some notes here and here. 2. Clean up your LinkedIn profile. As mentioned above, social media has become a vital resource for screening candidates, but it is also a great resource for professionals to network and highlight their desirable achievements. One of the best networks to leverage if you’re a social job seeker is LinkedIn, the original career social networking site. Not only is this social media platform the most popular professional networking sites online today, but LinkedIn also offers its users features to encourage engagement, such as Who’s Viewed Your Profile, Job Seeker Premium, Jobs You May Be Interested In, and many more. Check out these posts for more tips on how to keyword-optimize and master your LinkedIn profile. 3. Know what you want. Before setting out on your mission to find that dream job, sit down and reflect on what you want for the year ahead. Do you want to stick with the career you have, or would you rather pursue a different path that is more fulfilling in the new year? Is 2014 the year for you to take the entrepreneurial leap of faith? The last thing you want to do is repeat the same mistakes and relive the same disappointments that you had the year prior, so take a moment to envision exactly what you want your 2014 to look like. Then, make a plan. Write down exactly what you want in a journal and read it every night before bed, or first thing when you wake up. When you know what you want out of life, it’s easier to focus your efforts on achieving those goals and, more importantly, get back on track when life throws you a curve ball. 4. Find a mentor or two. Mentors are worth their weight in gold, if you find a willing and able one. Countless business leaders attribute their success to the mentors who have guided them through the good and the bad in their professional journeys. In addition to being a beneficial aspect to boosting your career and knowledge, seasoned mentors usually have networks that run very deep and wide for you to tap into. Read this post on how establishing the right connections makes all the difference between a mediocre career and a booming career. 5. Don’t settle. You don’t have to find a “forever job” right off the bat, so don’t be hesitant to take on jobs that will allow you to utilize your skills, enhance your resume, and afford networking opportunities for future job opportunities. If you’re getting antsy about being jobless, then why not put your time and efforts to good use and volunteer with a charity that fights for a cause close to your heart. Chances are, the charity of your choice is looking for volunteers to donate special skills that you can offer, or, even better, they may be looking to fill a job opening that you’re qualified for. Don’t settle and give up when the going gets tough during your job search. Take a step back to refocus and try something new. The New Year is for new beginnings, not for carrying over the bad habits from the previous year. Make 2014 the best year yet and set realistic, attainable goals for your career. 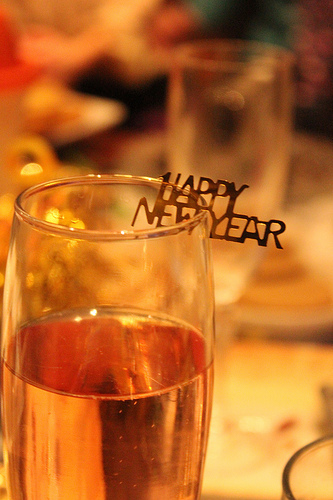 What New Year’s Resolutions are you establishing for your career? Share your 2014 goals with our community on Twitter using the hashtag #MakeItHappen or in the comments section below.